Expat Living reader Laura Burrill finds towering temples and so much more on a family trip to Central Java. From around the age of eight, I wanted to see Borobudur. I have no idea why; I didn’t even really know where it was, but I saw it in a book and the image of the huge shape rising out of the exotic forest stuck with me for over 30 years. 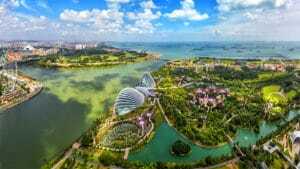 On moving to Singapore, I discovered it was within the magic three-hour flight time that is so manageable with two young kids, and so Java went on our “Singapore Travel Bucket List”. Three years passed, and it was still on the list – there were just way too many interesting places to explore and I think my husband wasn’t overly keen to waste the holiday days and his hard-earned cash on going to see “yet another temple”. But when we realised we had just one more year on this sunny isle, we decided it would be worth a quick jaunt. Despite the almost complete lack of travel books, guides or information on the internet, we put together a six-day trip that we hoped would cover the main tourist highlights, plus some down time and interesting activities for the kids. And we weren’t disappointed. This was an unforgettable trip, full of experiences we never expected and may never have the pleasure of seeing or enjoying again. Oh, and the food was amazing! It became very apparent during our stay that Java is barely on the tourist map for those outside Indonesia, which is such a shame as it has so much to offer. Since it deserves a spot on your list too, here are some travel tips in the form of our family highlights. The first thing to know about the city of Yogyakarta is that it’s pronounced “Jogjakarta”, and, as we discovered minutes after landing at the airport, it’s known locally as “Jogja”. This is where the heart of Javanese culture can be found, with amazing examples of a rich artistic heritage all over the city, including batik fabrics, shadow puppets, Gamelan orchestras and dance performances. If you love shopping, don’t miss Jalan Malioboro, a street selling anything and everything. It also has Pasar Beringharjo, a crazy four-storey market stuffed full of clothes, handmade crafts, bags, batik, local dance costumes, antiques, food and much more! For those looking to discover the history of the city and island, a visit to the Kraton (or Keraton) is a must. As the Sultan’s home (past and present), it’s a simple and elegant palace filled with interesting treasures, which are all happily explained to you by a “free” local guide – well worth the tip at the end! Be sure to head here in the morning; as we found out, it’s only open until around 1pm. An unexpected highlight of Jogja is the transport! A particular favourite with children is the andong, a traditional horse and carriage that takes families for a little trip around the city for around S$10. Favoured by locals and tourist alike is the becak or motorbike rickshaw – it’s cheap, quick and often hair-raising fun, and it offers a great way to get between tourist spots; also, the drivers often know about good family-friendly places to eat. If you’re feeling particularly adventurous and love the thrill of speed, you can opt for an off-road jeep tour of Indonesia’s most active volcano, Merapi. It’s less than an hour’s car journey from the city, and you can get up close and personal as you follow the Merapi Lava Tour – but hold on tight, as this is one seriously bumpy ride! Then there’s the spectacular Prambanan – like nothing I’ve seen before. Surrounded by lush green gardens and with loads of space for children to run around, this 9th-century collection of Hindu temples is utterly fascinating, and for an additional fee of around $10 you can have a private tour guide too. One of the lushest, greenest agricultural areas I’ve ever seen, Magelang was the big surprise of our trip. Just over an hour’s drive from Jogja, this area is home to Borobudur, which we arranged to see at sunrise. The temple was utterly magical, totally fascinating and as beautiful as every picture I’ve ever seen. But I won’t say too much about the experience – suffice to say that it’s something you must see for yourself. Instead, I’ll discuss what the limited guidebooks don’t tell you: all the other incredible stuff there is to do in the vicinity of Borobudur. A number of small companies offer local village tours, which your hotel will happily arrange for you. These are sure to be a huge hit with children. Not only do you get to ride on an andong through quaint villages and lush fields, and see rice, tobacco, cassava and various tropical fruits being grown and harvested, you can visit people’s homes, see local foods being produced (and sample them), try your hand at pottery, learn traditional children’s games and even have a lesson in traditional Javanese music on the gamelan. Owned by artist Umar Chusaeni, Limanjawi Art House is a fascinating and incredibly beautiful art gallery bursting at the seams with paintings and sculpture by local artists and antiques from the area. On the day we arrived, the gallery was closed as they were preparing for their next exhibition, but the very friendly Umar assured us the Art House is always open and showed us around, even taking us to his kitchen – there’s so much on display that every wall is needed. Situated next to the little Pawon temple (covered in scaffolding during our visit) is the super cute Pawon Luwak Coffee Shop. Alongside a full explanation of how the special luwak coffee is made (the coffee beans are digested by a civet and then collected, cleaned and roasted), you can meet a civet, feed it a banana and try the delicious brew in their gorgeous café garden. Bags of ground beans are available to purchase and take home – a quirky gift for coffee lovers and foodie friends. Indonesian rupiah. Cards are accepted at major tourist sites, but smaller places and local shops only accept cash. • Sheraton Mustika, Yogyakarta – family-friendly suites, a spa and pool, and two really good restaurants, both with a children’s menu of old favourites that are a great backup when the kids are too tired to be adventurous with eating. • Satoria Hotel, Yogyakarta – adjoining rooms for families, with a rooftop bar and pool and a great view of the city scape and planes landing at the airport. • Plataran Heritage Borobudur – beautiful hotel with adjoining rooms for families, a great restaurant with Asian and Western dishes, pool and rooftop bar. It’s the sister hotel of Plataran Borobudur Resort and Spa, which has a beautiful restaurant called Patio with views of Borobudur itself. The reception will happily book a table for you and order you a little buggy for the five-minute drive. • Take ear plugs! The people of Central Java are predominantly Muslim and while the call to prayer at 4.30am in the morning is beautifully atmospheric it can mean a very early start to the day.